One of the best things about being enthusiastic about my chocolate hobby is that people love to talk about it and taste it with me. Through friends I end up finding chocolate that I would never otherwise discover. My friend and co worker, Rene Fabre, is a regular visitor as well as a blogger about the Renton Farmers Market (see his regular posts on TheBlackberryChronicles.com ). At my regular 9-5 job, which has nothing to do with chocolate, Rene teaches classes and I promote them. He knows my chocolate enthusiasm so when he spotted Trevani Truffles at the market he picked some up to share at our next class planning session. 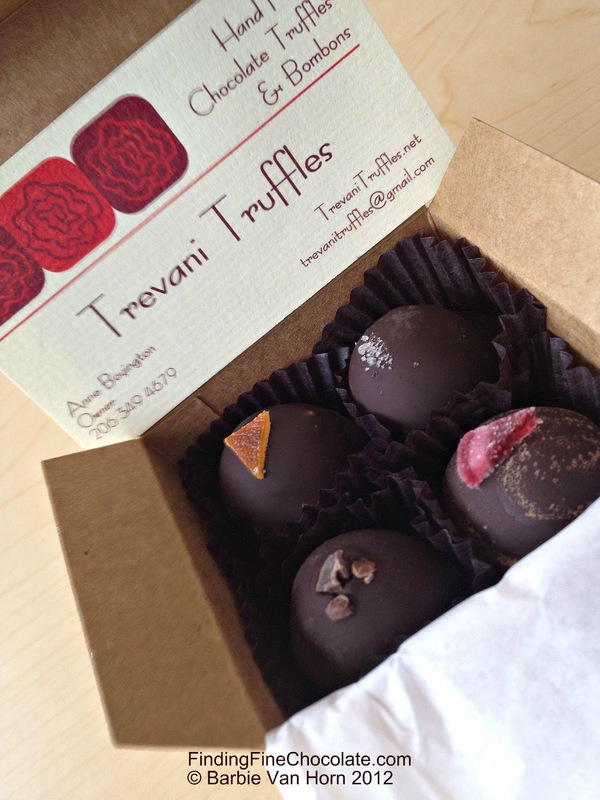 Trevani Truffles is a small local company started by Annie Boyington. Her truffles were only available to close friends and family as holiday treats until her kids, Eva and Troy, convinced her to make them public in 2007. Anne uses Venezuelan chocolate (58% for the ganache, 73% for the shell) and local ingredients whenever she can. Her flavor inspiration comes from just about anything. If it sounds like it would be good dipped in chocolate she will give it a try. All of the truffles we tasted were filled with creamy ganache, covered with a dark hand dipped shell, and had delicate, subtle flavors. We tasted one sweet raspberry wine and another with blood orange oil and orange liqueur, plus a few others. 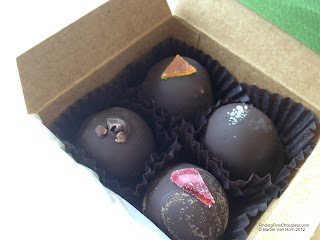 Now Anne and her truffles, in various seasonal flavors, can be found at various farmers markets around the Puget Sound. Interesting tidbit; although the name may sound Italian it is actually an abbreviated scramble of the names Anne, Troy, and Eva. Rene brought the Trevani Truffles and I happened to be carrying the latest four bars of Kallari Sacha that I had reviewed. It turns out that tasting chocolate and planning classes work very well together. Rene, thank you for introducing me to Trevani Truffles!